Department for Transport: Cycle casualties increasing rapidly in London. The Mayor is very proud of saying things like this: "The Mayor's cycle revolution has given cycling in the Capital an enormous boost...Crucially, the overall number of cyclist KSIs (people killed and seriuosly injured) on London's roads has fallen by almost a fifth since the mid-to-late 1990s (18 per cent). Although ten cyclists died last year, the number of fatalities of pedal cyclists in the Capital has fallen with a reduction in 2010 of 23 per cent against 2009." What TfL didn't mention was that when those figures are combined with the number seriously injured, there was an eight percent rise in cycling casualties, despite a decline among other road users. So far this year alone, 14 people have been killed cycling in London. A majority of them crushed under HGVs at junctions. It is precisely at junctions that Transport for London's investment in cycling simply stops. They just don't sort out the junctions to make them safe. Have a look at the plans for Vauxhall's new cycle super highway. They're scandalously dangerous. Vauxhall's superhighway won't be too dissimilar to Bow junction, where a man was killed on the utterly useless cycle infrastructure there. Only it will be even worse. TfL. Brand new cycle super highway. Underneath a lorry. As normal. The same pattern is repeated again and again on Transport for London's roads. Get to a junction and the cycle lane disappears and you're literally forced out of the cycle lane by HGVs, buses and cars. Here's a picture of the Cycle Super Highway on Southwark Bridge at the junction with Upper Thames Street. Can you see the cycle lane? It's UNDERNEATH the lorry. The cycle lane goes straight on. The lorries turn left. Institutionalised death trap in other words. Earlier this month the Department for Transport released some figures of its own. These show casualty rates for each mode of transport in each region in England in 2010, calculated as casualties per km or mile travelled based on the number of casualties and DfT's own estimates of traffic in each region. If you crunch the 2010 numbers against previous years, you can show the trend in London and the rest of England for each mode over several years. The important thing about these figures is that they show the trend in the accident rate for each mode of transport in London over time. 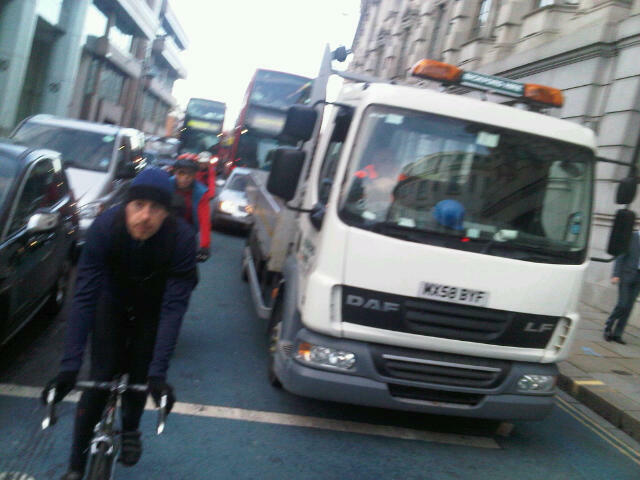 Transport for London has consistently spun the message that cycling is getting safer in London. But if you look at the figures from the Department for Transport, that is blatantly not true. According to these official DfT statistics the casualty rate for cycling in London has actually risen four years in a row. 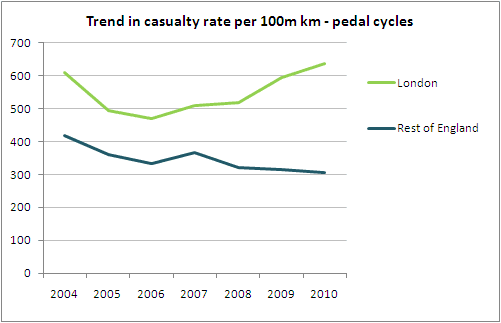 And is completely out of line with casualty rate for cycling elsewhere in the country. Transport for London and the Mayor need to wake up. That's why I'd urge you to join us for our Junction Flashride to protest for safe junctions for pedestrians and cyclists. All around London. Things have got to start to change. For an excellent synopsis of how things stand in the world of London cycling at the moment, read road.cc's article here. Quick question. What does "per 100m km" mean? Is there a link to the original source for this? Yes, click on the Dft link half way through the article. I think it's "per 100 million km". It's a figure which should be independent of the actual number of cyclists. A rising curve means more danger to cyclists. Hmm. The curve is accurate on that basis, but looking at the last five years' changes the situation is by no means as "blatant" as the blog suggests. Actual numbers of causalities are still small and annual shifts in the balance between fatal, serious and slight injuries muddy the waters too. So while it is clear that something bad is happening (with 2010 seeing an overall deterioration for cyclists) a worse crisis is on its way if bodies like TfL don't actively plan to reduce accidents, rather than waiting for worse disasters to mount up. Much better to have steady safety improvements that adopt best European practice than spend efforts on arguments about whether this year is a bit worse or much much worse than expected. Like the traffic policy - calming and separation measures are much more welcome than policies that try to improve the flow of the strongest. We need a zero tolerance policy towards cyclist deaths, not a policy that says current levels or faint downward trends are OK.
CS3 has a long segregated stretch, while CS7 doesn't. Note how CS3 does better and just about every metric: a high proportion of people use it because it 'feels safer' or is 'more pleasant' (p. 31), more people say it improves reliability and journey time predictability, it scores higher on most route quality indicators (p. 35) and it has a lower maintenance cost, presumably because much of its length is cycle-only (p. 44).